Music can be a great form of conversation, a giving and taking. Ideally it fosters deeper connection and communication between two musicians. The value of such a conversation lies in mutual recognition and acknowledgement – with the quality dependent on how much one is willing to share with the other. And this is one reason why the title of the album by GENTLEMAN and KY-MANI MARLEY says so much in its simplicity: “Conversations” is more than a collaboration, more than a combination. The pair have shared a lot together – all 14 tracks on the album are audibly influenced by personal dialogue, tracing the interaction of ideas and feelings. 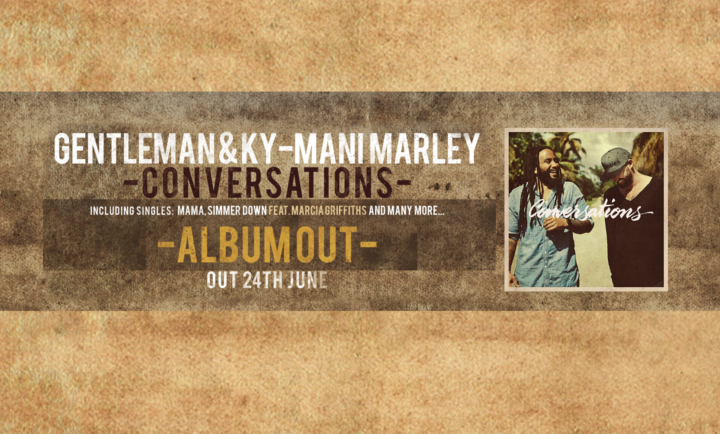 Like any good conversation, the “Conversations” by GENTLEMAN and KY-MANI MARLEY are an invitation to discovery. Fruitful collaboration for GENTLEMAN’s MTV Unplugged concert in August 2014 was followed by a tour on which the two artists became friends. As they talked and got to know each other before, after and sometimes during the shows, they laid the foundations for “Conversations”. During a phone call a short while later, when KY-MANI brought up the idea of recording an album together, the pair were soon agreed. They lost no time in starting work, wanting to capture the energy of their tour shows and rehearsals while it was still fresh. As a result, their album project turned out to be a refreshing way to work. GENTLEMAN describes the album as “more willing to experiment” – influenced firstly by the pair’s discussions and songwriting sessions together, but also by conversations they had with artist friends such as Clay and Daddy Rings during the project. Perhaps it is the special story and atmosphere that led to “Conversations” that make GENTLEMAN and KY-MANI seem more introspective, thoughtful, even vulnerable on the album. You can sense it from the opener “Signs Of The Times”, in which delicate touches of piano carry the melancholic lyrics to a conciliatory ending. In the certainty, as KY-MANI sings, that there is “a plaster for every wound”, even in times of war, fear and flight we can still count on things taking a turn for the better. Every crisis and every war contains the seed of an opportunity to make it better again. All we have to do, as it says in “Tomorrow”, is to sometimes leave our comfort zone. Lyrically and musically, “Mama” is an outstanding track. Produced by Supadups (Drake, Rihanna), the song for two loved mothers becomes an anthem to all noble, self-sacrificing mothers. “Way Out” offers a brilliant creative twist, as GENTLEMAN uses different perspectives for the first time in a song – in this case those of a young refugee and a soldier. “No Solidarity”, one of the highlights of the MTV Unplugged performance, recalls the start of the pair’s project, while their cover of the old Bob Marley hit “Simmer Down”, first released in 1964, is a nod to the beginnings of the music that means so much to them. Specially for this song, the two artists called in some famous female assistance: Marcia Griffiths, who worked with Bob Marley as a backing singer in the legendary I Threes, sings the hookline – and appears in the video, shot in Cuba. But ultimately the album title “Conversations” is meant first and foremost as a call to us all. At the end, GENTLEMAN confesses: “There are few things I miss as much in 2016 as the willingness to exchange views with each other, listen to each other, take time for each other, approach each other and enter into conversation. But I think it will come back the more we get better at dealing with the challenges of the new age…” Now it’s up to us to strengthen this belief, and it increasingly seems we’re not alone. In bigger cities, you see more and more cafés and bars with a sign outside saying: “No Wi-Fi – Talk to Each Other”.